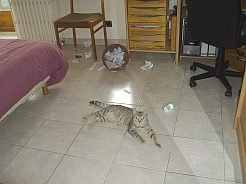 It was obvious Willow was bored as she had emptied the wastepaper basket and strewn the contents all over the bedroom floor. So I decided it was time to introduce her to a new plaything – SNOW. 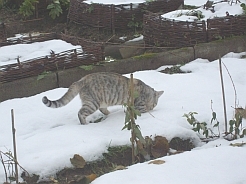 She was a bit wary at first, and preferred to run up and down the (snowfree) path but curiousity got the better of her and she enjoyed exploring the garden in it’s new white dressing. I made snowballs and she patted them about with her paws but the camera batteries ran out before I could take any more pictures. 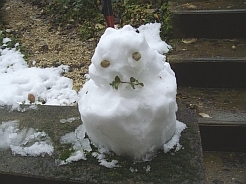 My daughter thought I was completely mad but I made a ‘snowcat’ for our litle family of felines. 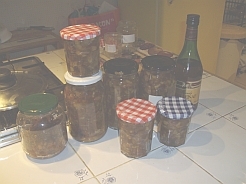 Marie and Michel brought us a huge basket of apples from their garden so it seemed like a good time to make the mincemeat. I don’t like the traditional recipe with suet (not that I could buy suet here anyway) so I always make a cooked version based on apples. You peel and chop 3lbs of apples and cook them in a pint of cider with zest and juice of an orange and a lemon. 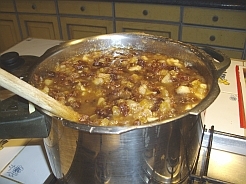 Once it comes to the boil, simmer for 10 minutes. Then add 2lbs of mixed dried fruit, 1lb brown sugar and 3 teaspoons of mixed spice (more if you like). Once the sugar has melted, leave to cook gently for another 15 to 20 minutes. Leave to cool completely and then stir in a good quarter pint of your favourite spirit. The recipe says rum but I use brandy. Spoon into jars and leave for at least two weeks before using. I made a double quantity as most of my friends and neighbours like coming round for mincepies. It’s a shame my pastry is a bit hit and miss though. After letting us become lulled into a false sense of security with the ‘catproof fence’, this week Toby made his bid for freedom and did a Houdini. When the others came in for tea he was nowhere to be found. We all searched the house and garden several times calling until we were hoarse and eventually we came to the conclusion that he must have got out to the front of the house via the garage perhaps. We all went out into the road with hearts in mouths in case we came across an injured cat – or worse – and called him again and again. He had appeared at the back door. It was a huge relief, but also a bit worrying. Our catproof fence was flawed: he had found a loophole. 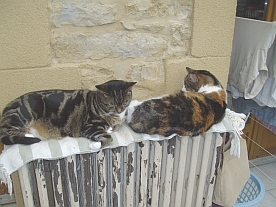 Yesterday was taken up with appointments in town so we kept all the cats in. Today CC and I inspected the fence and tried to work out how Toby had got out. There was one possible gap near the shed so we closed that and then let the cats out under supervision. Toby knew he was being watched even though we hid behind bushes and pretended to be weeding but, fortunately I was nearby when he made his move. He nipped up a post by the soon-to-be gate and I just caught him at the top. He was pretty cross at being brought in but I was pleased to have found his escape route. Lunch was delayed while CC, Jay and I made temporary repairs. We’ll do a proper job when Sylvain has installed the long promised gate. Yesterday’s appointments were an x-ray for Bear’s painful hip in the morning and a session at the opthalmologist in the afternoon. 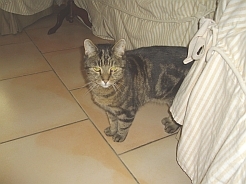 He checked Bear’s left eye and decided that despite the existence of yellow spots (macular degeneration?) he would go ahead with a cataract operation in December. It is now up to us to make arrangements to see the anaesthetist and book a room at the polyclinic. I was there for laser treatment because after last year’s operation the implant had become cloudy. I had no idea what to expect but was surprised when he asked me to sit at a table in front of a machine which closely ressembled all the other eqipment he uses for eye examinations. “Rest your chin there and press your forehead firmly against the bar” – as usual. The only ‘extras’ were places to rest one’s feet and instructions to hold on to the side of the table. He then asked me to look at the green light with my right eye while he dealt with the left. It lasted about five minutes but I was aware of blinking pretty frequently and finding it difficult to keep perfectly still, especially when I wanted to swallow. However, he was quite kind and patient. The laser was a red light and didn’t hurt at all but it was disconcerting to feel and hear a kind of click or pop at the back of my head every time he fired it. Afterwards he said I would probably have ‘mouches volants’ (literally flying flies but I suppose he meant floaters) for a few days but that there should be no pain or loss of vision. If that happened I was to come back immediately. We paid 240 euros (reimbursable) and came home. There are drops to apply three times a day for six days – and yes, I do see little black ‘insects’ occasionally but on the whole I am pleased with the result. There is another appointment in a couple of weeks when I hope he will prescribe a change of correction for my glasses as I still don’t see as well as I’d like. 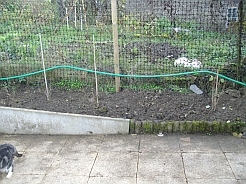 It’s unbelieveable the difference made to our garden in less than a week. Pete took up gardening when he retired from teaching and when I suggested that he might like to come over and do our garden it was a pleasant surprise when he agreed and the results far exceeded my expectations. 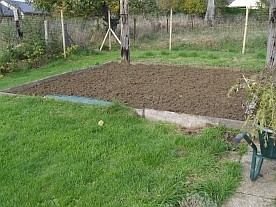 His wife, Penny, speaks French and was looking forward to a chance to meet and converse with French people again so I arranged for her to meet various friends while Pete got to grips with the weeds and planted a new hedge in front of the vegetable garden. The plants (mainly hypericum) arrived a week before our guests so I kept them in a bucket of water. They looked a bit sorry for themselves but we’re hoping they will take. 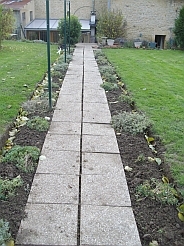 The path is now completely weedfree and Pete has edged the border beautifully. It’s now up to CC and me to keep it that way. 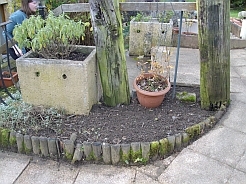 We had already tried to weed it and replant the aubretia more evenly but Pete did it properly! Then there was the very overgrown patch near the shed. I’ve never known what to do with it as the thyme died off and then the forget-me-nots went a bit wild and mixed in with the weeds. 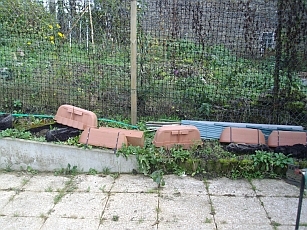 It became a dumping ground for the wndow boxes when they were finished and looked very untidy. and you may also notice the absence of weeds between the tiles. 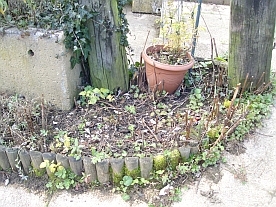 Then there was this unkempt patch which was full of ancient raspberry canes. I had salvaged the best and transplanted them along the fence but couldn’t dig up the remaining roots which were even spreading along the top of the bank. 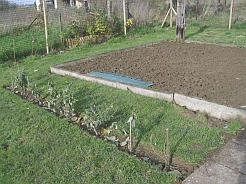 Pete worked his magic and in no time it was clean and tidy. 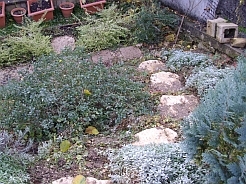 He has also removed the ivy that was choking the sage and discovered some thyme that had been struggling underneath another plant. Now we have to think what to put in the newly found space. 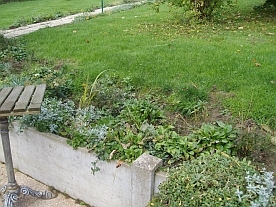 This flowerbed was pretty untidy and overgrown with weeds. You could also say that the edge wasn’t very well defined. 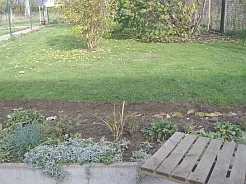 In less than no time Pete had weeded it and dug a neat edge ready for us to plant some annuals in the Spring. He trimmed the forsythia and other bushes, mended the lawn mower and cut the grass and all of this was done and dusted in three days. That meant that we had the rest of the week to show them round our little corner of France. The Ardennes region is noted for hills and trees and these were resplendent in their Autumn colours. We ventured into Belgium and visited the Abbey of Maredsous, famous for its beer and cheese and also delicious wholemeal bread. Dinant was almost as crowded as it is during the Summer but we admired the scenery along the Meuse and popped in to see friends near Givet (and to use their loo!). We rounded off the week with a meal at the local restaurant last night and then, sadly, waved goodbye to our guests this morning. We all hope they will come back again soon – for a proper holiday as CC and I are now inspired to keep the garden up to standard. The plumber finally came to see why the radiators weren’t working properly. I’d tried bleeding them but there didn’t seem to be any trapped air. His verdict was that because I’d left them in the ‘off’ position they were stuck like that. A few bangs with his hammer sorted out the problem and now the cats are vying for position once again. The estimate for re-installing the fireplace came to almost 2000 euros. We are looking into the possibility of a freestanding woodstove costing less than 1000 but are waiting for an artisan to let us know the price for sipplying and fitting a stainless steel chimney lining. Invitations have arrived for the two seasonal meals: the Maire and Council’s ‘do’ is on December 7th – the day before Bear is due to have his cataract operation so the doctor has told him to stop the alcohol after the champagne and drink water during the rest of the afternoon. The ‘Club’ meal is on December 16th. It costs 18 euros a head this year but will be well worth it. Hallowe’en was a bit rainy last night but it didn’t prevent about a dozen youngsters from dressing up and ‘trick or treating’. Last year I bought a supply of sweets that appeal to children rather than adults and there were lots left over. This year I bought mini chocolate bars – Mars, Lion, Twix and Kitkat. I put them in a wooden box and challenged the callers to ‘Open the coffin’. It was lovely to watch their expressions change from slightly anxious curiosity to delight. Everyone had at least two each but there are still lots left to ruin our diets. 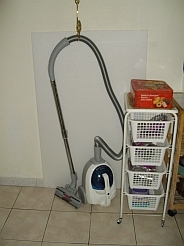 Bear has bought me a new vacuum cleaner as the old Oreck we brought over has finally given up the ghost. He confused supermarkets and insisted that we had a 69 euro model from Carrefour. I tried to tell him that the one we had seen on offer was from Cora and wouldn’t be available until the next day. He got really ratty and said if I didn’t have that one he would never buy me anything else – ever. I ignored him, plonked the vacuum cleaner back on the shelf and finished the shopping. Back home he found the Cora leaflet and sort of apologised. The next day we went to Cora and bought the one on offer. It was 59 euros, bagless and I’m very pleased with it. But Claudine and I had to smile when we saw Bear’s method of storing it. Next week we’ll be pretty busy looking after our gardening guests so there may not be time to post. However, I’ll let you know all about it later.